What is the correct spelling of his name? There multiple spellings that perhaps indicate Handel's cosmopolitan pan-european career. he was christened in Halle (Germany) as Georg Friederich Händel, although he first signed his name using an alternative spelling for his middle name Friedrich. In many European countries today the German form of his name remains prevalent, even though he himself discarded the umlaut at an early age. It seems fair enough that Germans feel possessive enough to keep using the umlaut, but for others to insist on calling him Händel is similar to arguing that the French composer Jean-Baptiste Lully ought to be called Giovanni Battista Lulli because he was born in Florence. based in London permanently from about 1712, he became a naturalized British citizen in 1727. 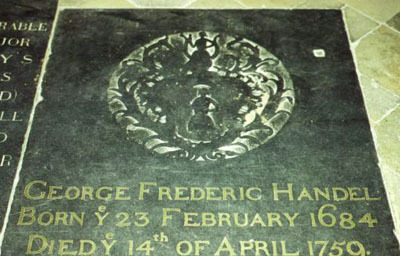 Therefore his chosen Anglicized form of name was undisputably George Frideric Handel, as it also appears in documents and publications authorized by the composer and on the monument he paid for in Westminster Abbey. What was Handel's religious background? Handel was born and baptised into the Lutheran faith (i.e. Protestant); apparently he resisted attempt to convert him to Roman Catholicism while in Rome as a young man, and his British nationalization in 1727 required him to be a practicing member of the Church of England. Where can I find the words (libretto) to Messiah? Please here for the libretto. How did the tradition of the audience standing during the 'Hallelujah' chorus (from Messiah) begin? Did a King start this tradition and why did he stand? "...When Messiah was first performed in London (1743), when the chorus struck up, 'For the Lord God omnipotent reigneth' ['Hallelujah Chorus'), reportedly the audience and King [George II] stood and remained standing untill the chorus had ended..."
In short, we cannot be certain King George II was even present at this performance of Messiah. Assuming he was present and that he was the first to stand, we certainly cannot adequately speculate on what motivated him to do this. There are other theories, but it is possible that the tradition of standing for the 'Hallelujah' chorus was not connected directly to Handel's own performances in any way. When was Messiah first performed in the United States? "...A SACRED ORATORIO, on the Prophecies concerning CHRIST, and his Coming: being an Extract from the late Mr. Handel's Grand Oratorio, called the MESSIAH, consisting of the Ouverture, and sixteen other Pieces, viz, Airs, Recitatives, and Choruses. Never performed in America." Messiah in its entirety (albeit spread over several nights) was performed by The Handel & Haydn Society (Boston). On each successive night (1, 4, 6 April, 1817) one part of Messiah and the corresponding part of Haydn's Creation were performed.It wasn't until Christmas Day, 1818, (at Boylston Hall, Boston, performed by The Handel & Haydn Society), that the entire oratorio had its single-performance United States premiere. Can you recommend any books on Handel? If you want more detailed information: Jonathan Keates' Handel: The Man and his Music (2nd edition, Bodley Head, 2008). If you interested in the definitive scholarly biography: Donald Burrows' Handel (2nd edition, Oxford University Press, 2012). Visit references for an extensive list of Handelian literature. If Handel was born in 1685, why do the Westminster Abbey Handel monument and floor plaque list his birthdate as "February XXIII, MDCLXXXIV" and "1684", respectively? Similarly, why was the first centennial festival of his birth observed in 1784? Handel's contemporaries believed Handel's birthdate was 23 February 1684. This spurious birthdate was miscalculated under the incorrect assumption that Handel was born under the old Julian calendar. Rather, at the time of his birth in Saxony/Magdeburg, the new Gregorian calendar was already in use there. Dates using the Julian calendar placed the beginning dates of a year (up through March 25 — the day the "new year" began in the Julian calendar) as dates from the previous year. What is the other name for "Handel's Largo" and from which of Handel's larger compositions does it originate? Never was nature's own shade more beloved or sweetly treasured than thine. From which of Handel's larger compositions does 'Lascia ch'io pianga' originate? and let me sigh for liberty. if only for pity's sake. and all things flourish where'er you turn you eyes. What are the lyrics to the aria 'See, the conqu'ring hero comes!'? The chorus is from Joshua, but was later inserted into a revival of Judas Maccabaeus and is more famous in that context. What is Handel's relationship to the hymn 'Thine is the Glory' (or 'Thine Be the Glory')? Did Handel compose Christmas carols? Indirectly, yes...John Foster (1762-1822, of High Green House, Yorkshire) composed While Shepherds Watched Their Flocks By Night by adapting the aria 'Non vi piacque, ingiusti Dei' from Handel's opera Siroe. Many versions of Hark! the Herald Angels Sing were composed during the 18th Century. Edward Miller (1735-1807, Doncaster) composed a version by arranging 'See, the Conqu'ring Hero Comes' from Handel's oratorio Judas Maccabaeus.Thomas Taylor (Chester) reworked the harpsichord suite The Harmonious Blacksmith to yield Hymning Seraphs Wake the Morn. Joy to the World was not composed by Handel. The tune first appeared in the early 1830's in English tune-books. William Holford revised the tune and published it (which he called Comfort) in the mid-1830's and attributed it to Handel because of the tunes' resemblance to the opening phrases of the choruses Lift Up Your Heads and Glory to God from Messiah. The American composer Lowell Mason (1792-1872) in 1839 retained the attribution to Handel, changed the tune-name to Antioch, and united it with Isaac Watt's hymn [i.e., text] for the first time. Thus, Joy to the World was born. For further listening, Hyperion Records Ltd. released a recording which features some of these works. From which larger work does Handel's 'Dead March' originate? The 'Dead March' (lamenting the deaths of Saul and Jonathan) comes from Act III of Handel's oratorio Saul. From which larger work does Handel's 'Arrival of the Queen of Sheba' originate? This 'Sinfonia' opens Act III of Handel's oratorio Solomon. It's nickname was invented in the 20th century. What are your favorite Handel recordings? Which recordings would you take with you to a desert island? This would change according to when you ask. Click here for Brad Leissa's desert island discs, here for David Vickers's selections, and here for Philippe Gelinaud's recommendations - these give a snapshot of how we thought about things in the early 2000s. When did Handel compose 'Thanks Be to Thee', 'Dank sei Dir, Herr', or 'Solo con te'? Although choral publications or recordings with Jessye Norman, Sarah Brightman, or Barabara Streisand attribute these works to Handel, it doesn't appear Handel composed any of them. 'Thanks Be to Thee' is said to be an arrangement of Handel's 'Dank sei Dir, Herr'. However, this is a spurious Handelian work. References to 'Dank sei Dir, Herr' being composed by Handel date from the late 19th century in Germany. The true origins of 'Dank sei Dir, Herr' remain unknown. Channing LeFebvre arranged 'Dank sei Dir, Herr' for organ. Siegfried Ochs is generally attributed with the first arrangement of 'Dank sei Dir, Herr' resulting in 'Thanks Be to Thee'. 'Thanks Be to Thee' was arranged by many other composers, including Vogel, Page, Houseknecht, Christiansen, Harris, Shaw, Causey, Bement, Wilson, Wiley, Forsblad, Nichols, et al. Although the origins of 'Thanks Be to Thee' and 'Dank sei Dir, Herr' are cloudy, Handel scholars are convinced that Handel did not compose either work. (Note: For more information about this spurious Handelian association, see Martin Staehelin's paper titled 'Dank sei Dir, Herr' Zur Erklärung einer Händel-Fälschung des frühen zwanzigsten Jahrhunderts from the Göttinger Händel-Beiträge, volume 2, 1986. pp. 194-206.) With regard to 'Solo con te', this is a spurious Handelian work as well. Chiara Ferraù is credited with the lyrics. Jean Ashworth Bartle (director of the Toronto Children's Chorus) adapted the aria 'Dove sei, amato bene' from the opera Rodelinda. Lyrics were by WG Rothery. I'm planning a trip to Britain, and I'd like to visit some Handelian landmarks. What should I visit? Westminster Abbey: Louis François Roubiliac's Handel monument / tomb stands here in Poet's Corner. The Handel House Museum (25 Brook Street). Gerald Coke Handel Collection at The Foundling Museum (40 Brunswick Square - site of The Foundling Hospital, where Handel gave charity performances). St. Paul's Cathedral -- where Handel performed on the organ. Burlington House, Piccadilly -- where Handel probably lived as a house guest of Lord Burlington during the mid-1710s. The original house was replaced by a new building in the 19th century; the site is now home to many societies including The Royal Academy of Arts. National Portrait Gallery -- portraits of Handel. Victoria and Albert Museum -- Louis François Roubiliac's marble statue of Handel. The Albert Memorial -- Handel (holding manuscript of Messiah) in a bas relief around the Albert Memorial. British Library -- Ninety-seven (97) volumes of Handel autographs (manuscripts) are housed here. Green Park -- where Music for the Royal Fireworks was performed -- Located near Buckingham Palace, with nearby St. James Palace and Spencer House fronting onto it. Vauxhall Pleasure Gardens (also known as 'Spring Gardens') -- Located on the South Bank, it closed in 1859 after the site was dissected by the new railway line to the south coast. All that remains today are a tiny park, bounded by railway arches, council blocks, and terrace backs. Fitzwilliam Museum -- houses the "Chandos Portrait" of Handel by Sir John Thornhill, terracotta bust of Handel by Roubiliac, and music manuscripts including autographs. Sheldonian Theatre, Oxford -- The University of Oxford's ceremonial hall is is the only surviving venue in which Handel performed any of his dramatic works (Athalia and several other English oratorios were performed there under his direction in 1733). Like St. Paul's Cathedral (London), it was designed by the architect Sir Christopher Wren. Oxford's Bodleian Library -- where Handel's original conducting score for Messiah is kept. The "Tenbury Collection" (which included Handel's score of Messiah) was transferred from the library at St. Michael's College, Tenbury Wells, Worcestershire, to the Bodleian Library in 1985. BENINGBROUGH HALL (North Yorkshire) -- Balthasar Denner's portrait of Handel and many other 18th century British portraits. MALMESBURY HOUSE (Salisbury) -- where Handel was a guest of James Harris, the Earl of Malmesbury. The North London Collegiate School purchased it in 1929. The church of St. Lawrence, Little Stanmore (alias Whitchurch) -- where Handel performed on the organ and the venue for his Chandos anthems. ADLINGTON HALL (near Macclesfield, Cheshire) - Handel performed on the organ. HOLY TRINITY CHURCH, TRINITY GREEN, GOSPORT (Hampshire) -- the church acquired the organ from Cannons when the house contents were auctioned in 1744. Although the organ has undergone considerable renovation and change over the years, some of the original work by Jordan is still intact, and the casing features the ducal crest of James Brydges. The "New Music Hall" on Fishamble Street -- where Messiah was first performed -- no longer exists. It became Kennan's Ironworks. Today, the New Music Hall's original door remains next door to the George Frederic Handel Hotel. The George Frideric Handel Hotel (16-18 Fishamble Street) Location of the "New Music Hall" (1741-late 1800s). Contemporary Music Centre (19 Fishamble Street) contains a bronze plaque commemorating the first performance of "Messiah". St. Michan's Church holds an 18th-century organ on which Handel reputedly prepared for Messiah. What is the 'Handel Medallion'? The Handel Medallion is the highest official honor given by the City of New York and is presented by the Mayor to individuals for their contributions to the City's cultural life. The Handel Medallion was established in 1959 on the 200th anniversary of Handel's death. Over the years, the Medallion has been awarded to renowned artists such as Benny Goodman, Richard Rodgers, George Abbot, Charlie Chaplin, Lena Horne, Martha Graham, Beverly Sills, Kitty Carlisle Hart, Leonard Bernstein, Dizzy Gillespie, Yehudi Menuhin, etc..
What is the 'Händel-Preis' (Handel Prize)? What are the 'Aylesford Sonatas'? What are the 'Fitzwilliam Sonatas'? Thurston Dart first called these works the 'Fitzwilliam sonatas' in his edition (1948) because the autograph sources are kept in the Fitzwilliam Museum at Cambridge. The Fitzwilliam materials are fragments of Handel's autographs that J.C. Smith the Younger kept after giving the bulk of the autographs to George III in the 1770s. They were put up for auction after Smith's death, and bought by Lord Fitzwilliam. Thus, when reference is made to the Fitzwilliam sonatas, it is with regard to Dart's edition rather than a complete set of Handel's sonatas devised by the composer himself or a contemporary publisher such as John Walsh (e.g. the "Opus 1" sonatas). Did Handel compose 'Silent Worship'? Arthur Somervell adapted the aria 'Non lo dirò col labbro' from Handel's opera Tolomeo; the result was 'Silent Worship'. 'Silent Worship' was performed by Gwyneth Paltrow and Ewan McGregor in the 1996 film adaptation of Jane Austen's Emma. With a glory of golden hair.